Cerritos Truck Accident Personal Injury Lawyers - Over 40 Years of Experience You Can Trust! Are You A Victim Of Truck Accident in Cerritos, California? With over 40 years of experience in handling truck accident personal injury claims and wrongful death cases, our personal injury lawyers and law firm in Cerritos, California, provide expert legal services for those injured in truck collisions and for the relatives and families of those killed in truck, car, motorcycle and other fatal accidents for wrongful death claims. If you’re injured in a truck collision, car crash or have any other personal injury claim in Cerritos, Los Angeles, Orange County or anywhere in California, you should contact us for a completely FREE CONSULTATION. Visit our home page, our lawyer profiles and our testimonials pages to know more about our experienced and compassionate truck accident personal injury lawyers and law firm. For a FREE personal case evaluation of your own particular truck accident or other personal injury claim, do not hesitate to contact us. Moreover, you can also get some quick general truck accident advice on our Truck Accident Injury Advice Section. Previously, dubbed as the ‘Dairy Valley’ because of the predominance of dairy farms in the area, Cerritos is a suburban city in Los Angeles County, California. According to the 2010 US Census, the population of Cerritos was 49,041. Cerritos, Calif. has two primary colleges, namely Cerritos College and UEI College. Some of the cities that border Cerritos include Artesia, Bell Flower, Lakewood, Norwalk, Santa Fe Springs and La Mirada. We are a caring, compassionate and hardworking team of lawyers for Cerritos that strive to make the process of handling a truck accident injury claim, and dealing with insurance companies and large corporations, as simplified and painless as possible, for you or the families of those killed in tragic truck crashes. Our truck collision personal injury attorneys and law firm are committed to providing clients with complete support and expertise in all areas of their personal injury and wrongful death claims, and explaining the process every step of the way. In addition, we aggressively pursue our client’s rights and all appropriate remedies to further their best interests including to obtain the maximum financial recovery. With numerous commercial trucks plying on California’s many highways, the state of California is prone to fatal truck crashes and commercial tractor-trailer accidents. A major reason for such high rate of truck collisions is that some truck companies neglect important safety aspects and are solely or too concerned with their profits, which results in shoddy maintenance and repair work, reckless driving due to truck driver weariness and fatigue, driving under drug influence (including trying to stay alert and awake when instead rest is required), and other causes. An astounding $100,000,000.00 plus in funds has been recovered by our experienced truck and car accident personal injury lawyers. 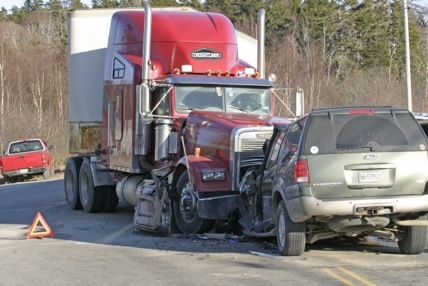 Our law firm offers expert assistance to victims of truck accidents with medical care (regularly without any payment until the case is resolved), specialists, property damage repair, and monetary settlement. You do not even need to leave your home or go to our law offices. We make everything as easy and convenient for you as possible. So, do not hesitate to get in touch with our Cerritos truck accident injury lawyers and our legal team now for a completely FREE CONSULTATION and case evaluation about your own specific case. Alternatively, you may also contact us by emailing us at info@WalchLaw.com! Our consultation is absolutely FREE and we work on a contingency fee basis, so there’s NO fee until you WIN! So there is no reason not to contact us now … you will be glad that you did!